500 grams skimmed milk cottage cheese. 1/2 teaspoon Lucknowi fennel powder. 1/2 teaspoon white pepper powder. 1/2 teaspoon green cardamom powder. 2 medium green capsicums, seeded and cut into 1/2-inch squares. 1 1/2 teaspoons chaat masala. 1. Cut the cottage cheese or paneer into one-and-a-half-inch squares of half-inch thickness. 2. Heat a non-stick pan. Add the gram flour and roast on medium heat until fragrant. Remove from heat and add the turmeric powder and mix. Cool and transfer to a bowl. 3. Add the ginger paste, garlic paste, white io!pper powder, salt, one tablespoon of lemon Juice, cardamom powder, fennel powder, saf fron and yogurt, mix and prepare a batter. 4. Add the paneer cubes to the batter and marinate for at least an hour. 5. 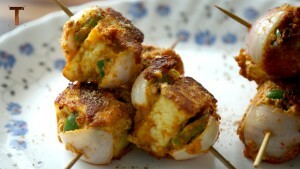 Thread the paneer cubes and the capsicum squares alternately onto the skewers. 6. Roast in a tandoor/charcoal grill for five minutes till the tikki are golden in colour. 7. Alternatively you can cook the tikki in a convection oven or on a grill. Preheat an oven to 220″C/425(T/Gas Mark 7 and cook for three minutes on either side. 8. Remove and sprinkle with the chaat masala and the remaining lemon juice. Serve with a chutney of your choice. Paneer is a great source of proteins. It is beneficial for people who weight train as they need protein for muscle building and repair. Paneer provide number of health benefits to their user. It is full of calcium. Calcium are very beneficial for stronger teeth and bones. Another advantage of using paneer is to prevent deadly diseases such as cancer by preventing the growth of cancer-causing cells in the body. It is also useful for the protection of heart disease.